We have installed a lot of garages in Perth, WA, and one of our favourites is the sliding door garage. The sliding door mechanism increases space in your garage, making the building itself more versatile. How does a sliding door increase space? A sliding door slides on “runners” or “tracks” that are located at the top and at the bottom of the door. The runners must be sturdy enough to provide stability and provide years of service. The tracks usually go around the inside perimeter on one side or the other side of the garage. This prevents the door from becoming an obstruction directly in front of or behind the entrance and increases the effective space of your garage. Another advantage is that you can open the door as wide or thin as you want. You can open it all the way or just wide enough for yourself to make it in and out. This makes it the most versatile design and the one that gives access to the largest objects. This operation is extremely smooth and effortless and lends itself well to remote access. The design of the runners helps promote security when your door is closed. It secures the door on both the top and the bottom and negates the effectiveness of anyone trying to smash his way in. They can be fastened and secured in any of many ways. In addition, their design is especially resistant to wind damage in case of a storm. Though most people fit the tracks on the inside of the garage, they can also be placed on the outside. This option isn’t often used and may present a few problems but it can be handy in a garage where every bit of space is needed. 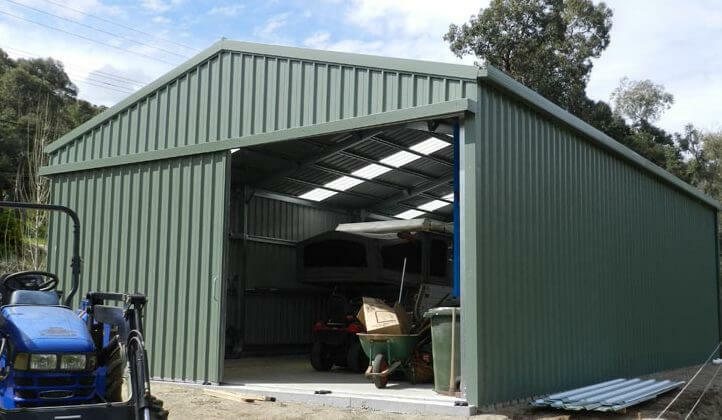 At Action Sheds Australia, we can custom build any size you need. With the sliding doors allowing for maximum entry capability, a lot of our customers have ordered them and are very satisfied. As with all of our products, our sliding door garages are ShedSafe certified and carry a warranty of 10 years on the structure and 15 years on the cladding. If you are thinking about a garage with a sliding door, call 1300 778 628. We will be happy to give you a custom estimate.